A collection of innovative research on the methods and applications of fog computing in technological, business, and organizational dimensions. Thoroughly examines fog computing with respect to issues of management, trust and privacy, governance, and interoperability. ISBN: 9781522554455; © 2019; 403 pp. Provides emerging perspectives on the theoretical and practical aspects of green industrial concepts, such as green supply chain management and reverse logistics, for the sustainable utilization of resources and applications within manufacturing and engineering. Featuring coverage on a broad range of topics such as additive manufacturing, integrated manufacturing systems, and machine materials, this publication is ideally designed for engineers, environmental professionals, researchers, academicians, managers, policymakers, and graduate-level students seeking current research on recent and sustainable practices in manufacturing processes. ISBN: 9781522574828; © 2019; 197 pp. Provides innovative insights into the biochemistry of plant lipases and phospholipases as well as their structures and catalytic mechanisms. The book explores the conserved domains and motifs of plant lipolytic enzymes by identifying the main residues involved in the catalysis in the enzymes and the phylogeny of important plant lipolytic enzymes, as well as calculating the evolutionary distance in those enzymes. 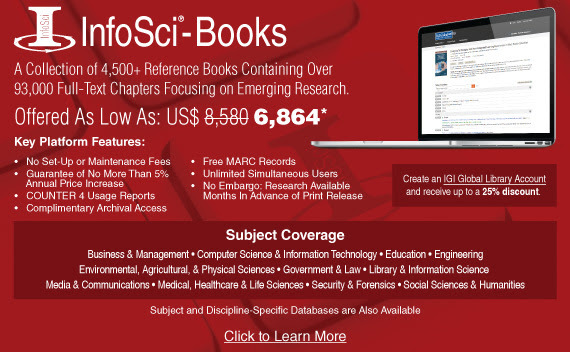 Organized into six chapters, it is a vital reference source for researchers, chemists, biologists, academicians, practitioners, medical professionals, engineers, and graduate students. ISBN: 9781522558552; © 2019; 337 pp. An essential reference source that discusses investigative trends in mobile devices and the internet of things, examining malicious mobile network traffic and traffic irregularities, as well as software-defined mobile network backbones. Featuring research on topics such as lawful interception, system architecture, and networking environments, this book is ideally designed for forensic practitioners, government officials, IT consultants, cybersecurity analysts, researchers, professionals, academicians, and students seeking coverage on the technical and legal aspects of conducting investigations in the mobile networking environment. ISBN: 9781522538110; © 2019; 106 pp.